Rhodri in trainingA Bangor University student is set to undertake Snowdonia’s gruelling 3000s 15 Peak Challenge to support people with osteoporosis. 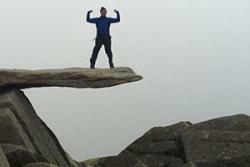 Rhodri Ogwen Morgan, 31, from Cricieth has taken on a challenge of a lifetime – by pledging to tackle the Snowdonia 3000s 15 Peak Challenge for Team Osteoporosis on the 12th July 2014. Having recently completed an MBA Environmental Management degree at the University’s Business School, Rhodri is hoping to raise over £500 for the National Osteoporosis Society. The National Osteoporosis Society is the only UK charity dedicated to ending the pain and suffering caused by osteoporosis and fragile bones. It affects 1 in 2 women in the UK, and 1 in 5 men over the age of 50. Regular weight-bearing exercise, such as running, helps maintain bone strength. Rhodri has been training hard for the event by completing various sections of the route around the Village of Llanberis with members of the Welsh Mountaineering Club and hopes to complete the world famous course in under 24 hours. Commenting on the enormous task ahead, Rhodri said: “I have been aware of the 15 peak challenge for a number of years but have never had the opportunity to attempt it. Although a very difficult challenge to undertake the support and motivation I’ve received from both the Welsh Mountaineering Club, Bangor University and the National Osteoporosis Society has been excellent and has helped me a great deal. I have a number of family members who suffer from Osteoporosis and the chance to raise awareness and money for the condition is a real bonus”. To raise money and awareness Rhodri has set up a Just Giving page and he would be grateful for any contribution to his cause.